Co-curricular refers to additional programs that complement our core academic offerings. 1. We will not forget that we are a school and that our mission is to partner with families in educating their children. Loading up our students with endless activities is not in the interest of the school or the families we serve. 2. Activities beyond the core curriculum will be “co-curricular,” complementing our core, and not simply activities that are extra or added on without clear curricular purpose. 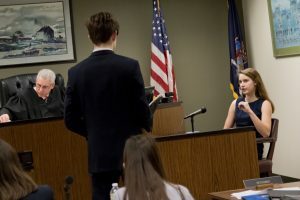 The Mock Trial program is part of the New York State Bar Association’s Law, Citizen and Youth Program. 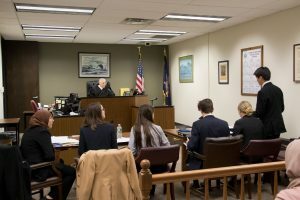 The high school team prepares for a competition using a standard set of procedures that are similar to formal trial procedures, but have been modified for use in the mock trial setting. Through review and practice of the case study (a “fictional” case presented to all the teams and used throughout the season), the team members develop their various roles, prepare a team strategy, and learn trial procedures. The Team is judged not only on their case presentation, but on their ability to follow courtroom procedures and on their professional decorum. Team members can either serve as witnesses or lawyers. Our goal is to honor Jesus, enjoy the competition, learn life-long skills, do our best and win medals. Christian Classical education focuses on the “tools of learning.” In Mock Trial, the students hone their skills in public speaking, persuasive writing, active listening, critical reasoning, team work, extemporaneous argumentation, ability in speaking with adults, self-confidence and poise while also learning about rules of law, rules of evidence, proper courtroom decorum, legal terminology and civic responsibility and attitude. ACA has swept the Saratoga County in regular season competition in four out of the last six years. The 2018 team is now ranked #1 in the County and has a bye in the first round of the play off. A win in the play-off tournament would secure ACA’s third trip to the Regional Championship and a shot at earning their second trip to the State Championship. ACA launched its Robotics team in the Fall of 2017 and marched off to its first regional competition later that school year. In its first showing, our team of designers, engineers, machinists, and programers managed to finish 12 out of 17 teams (right behind Niskayuna and just a head of Burnt Hills) and first among the three rookie teams at this year’s regionals. The robotics build season begins mid-summer when the rules for the new competition are released. The team meets during lunch throughout the year and after school on Thursdays. 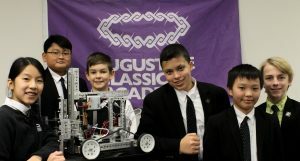 Supported by a pair of grants from Global Foundries, our team of students are delighted with the results of their first effort at robot building and are looking forward to pushing to the next level in the next school year. MathCounts is a national competitive math program for middleschoolers. ACA has had a team since our first year and though we have had some good years, this year’s team is without a doubt our strongest. 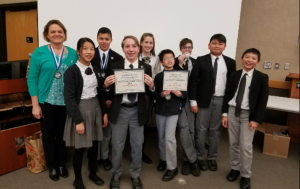 ACA Mathletes dominate Tri-County Chapter competition, winning the team competition and placing four in the top ten of the individual competition! This Saturday ACA’s MathCounts team headed off to the Tri- County Chapter regional competition. MathCounts is a national middle school math skills competition. Squaring off against schools from Saratoga, Warren, and Washington Counties the ACA team of Caleb Zhang, Alexandra Oxaal, Simon Gorss, and Isaiah Moore emerged as the winner of the team competition. In the individual competition, ACA placed four of its Mathletes into the top ten who qualified for the final round. They were Caleb Zhang (1st), Alexandra Oxaal (3rd), and alternates to the team Ethan Thate (7th) and Kevin Zhong (8th). The other alternates to the team who competed in the individual round were Ruth Zhang, and Joshua Wu. In the single-elimination countdown round, Caleb and Alexandra were able to maintain their ranking from the preliminary round finishing 1st and 3rd respectively. Our other two ACA mathletes in the countdown round, impressively stepped up their game with Ethan Thate moving up to a 4th place finish and Kevin Zhong moving up to 7th. The win qualifies the team to move on to the State Championship next month at RPI. Go Hippos, and congratulations to their coach Mrs. Lisa Fijal and the whole team!